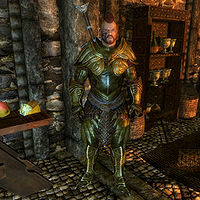 Unmid Snow-Shod is a Nord warrior who lives in Mistveil Keep as the housecarl of Jarl Laila Law-Giver. He is the son of Vulwulf and Nura Snow-Shod, and brother to Asgeir. He is also the boyfriend of Anuriel, the jarl's steward. If the Empire regains control of the Rift, Unmid will be exiled to the Palace of the Kings in Windhelm. Unmid wears elven armor with matching boots and gauntlets. He wields a steel greatsword in combat. In exile, he will comment on his current state: "Being in exile is the most humiliating thing I've experienced in my life." and tell of his experience: "I killed scores of the Empire's men before I was forced to surrender." He will explain why he surrendered: "The only reason I stopped fighting was a plea from Laila, otherwise I'd would have fought to the death."